Are you still at there in that white and cold town? [오피셜]추운 겨울, 김준수의 따뜻한 목소리가 담긴 스페셜 앨범과 함께하고 계신가요? 12월 여러분의 찬란한 추억을 떠올려 보셔요~! [TRANS] [Official] Cold winter, do you want to go through it with a special album filled with Kim Junsu’s warm voice? Imagine everyone’s bright memories in December~! 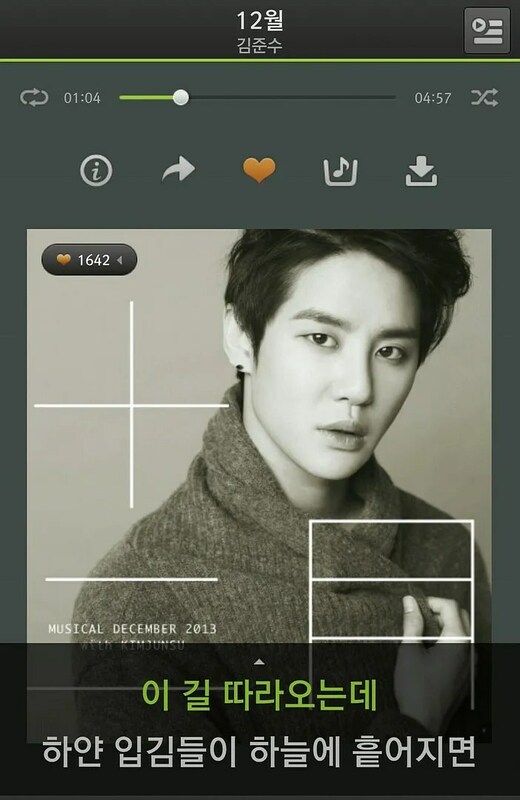 [LINE] 131218 JYJ Line Update: Musical ‘December’ special album with Kim Junsu has been released!! [오피셜] 김준수의 뮤지컬 ‘디셈버’ 스페셜앨범이 오늘 정오에 공개되었습니다! 김준수의 보컬로 재해석한 김광석의 대표곡과, 뮤지컬 삽입곡이 담긴 올 겨울 최고의 음반. 지금 바로 감상해보세요! [TRANS] [Official] Kim Junsu’s musical ‘December’ special album has been released today at noon! The reinterpretation by Kim Junsu’s vocal together with Kim Kwang-seok’s masterpiece of music, the musical soundtrack filled with the best record this winter. Try enjoying it right now! [Official] Junsu’s musical ‘December’ special album is released. now available on iTunes!! After appearing as a guest star in JYJ’s Kim Jaejoong’s concert, Gummy will be collaborating with another member of JYJ and fellow label mate Kim Junsu. This special album commemorates the 50th birthday of singer Kim Kwang Seok, now deceased, and Kim Junsu and Gummy are gaining much interest through recording one of his most beloved hits. The album also includes four more tracks. “The Reason For Love” reinterpreted by Kim Junsu and Gummy will display a vintage sound of the 90s in a retro medium tempo beat. Meanwhile, Kim Junsu will be also starring in the musical “December,” which will open its curtains on December 16. Gummy will be holding her joint concert tour with Wheesung titled “Do It” beginning December 14 at the Busan KBS Hall. [Official] Special Album <Musical ‘December’ 2013 with Kim Junsu> pre-released track ‘Serendipity’ is now available!